Rosenfeld, Gavriel D. (ed.). 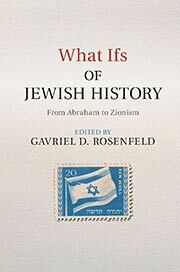 What Ifs of Jewish History: From Abraham to Zionism . Cambridge University Press 2016. Summary: Collection of 16 scholarly counterfactuals by historians, including Steven Weitzman's "What if the Exodus had never happened? ", René Bloch's "What if the Temple of Jerusalem had not been destroyed by the Romans? ", Jonathan Ray's "What if King Ferdinand and Queen Isabella had not expelled the Jews of Spain in 1492? ", Bernard Cooperman's "What if the 'Ghetto' had never been constructed? ", Eugene Sheppard's "What if Spinoza had repented? ", Jeffrey Veidlinger's "What If Russian Jewry had never been confined to the Pale of Jewish Settlement? ", Derek Penslar's "What If a Christian State had been established in modern Palestine? ", Adam L. Rovner's "What if the Jewish state had been established in East Africa? ", Iris Bruce's "What If Franz Kafka had Immigrated to Palestine? ", Kenneth W. Stein's "What if the Palestinian Arab elite had chosen compromise instead of boycott in confronting Zionism?" David N. Myers's "What If Musa Alami and David Ben-Gurion agreed on a Jewish-Arab state? ", Michael Brenner's "What if the Weimar Republic had survived? ", Gavriel D. Rosenfeld's "What If Adolf Hitler had been assassinated in 1939? ", Jeffrey Herf's "What if the Nazis had won the battle of El Alamein? ", Dirk Rupnow's "What if the Final Solution had been completed? ", and Jeffrey Gurock's "What if the Holocaust had been averted?". Comments: Known during development as "If Only We Had Died in Egypt!" What Ifs of Jewish History . Published: Cambridge University Press 2016 (110703762XBUY).